Add some extra fanfare to your mani this season with some easy stick on nail tattoos. Just seal them with a clear coat long lasting team spirit. Snapping a two game losing streak the Bears were able to shrink the Giants to 0-6 and will head into Week 7 with a healthy 4-2 record with a not-so-healthy defense. With season ending injuries to Henry Melton and DJ Williams along with an often sidelined Charles Tillman we'll need the defense to step up against the Redskins in order to ensure a top tier 5-2 record heading into the bye week. On paper this game was only a formality for the Bears and they should have easily walked away with the win off of a struggling 0-5 team, but in the NFL every team can upset and the Beats yet again struggled to put away the game in the second half. A 17-point second quarter gave the Bears a seemingly insurmountable lead heading into halftime, but defensive errors in coverage gave Manning and his receivers the chance to steal this one at Soldier Field. But with the Bears defense (Jennings) scoring a pick-6 in the 1st quarter the theory remained true that when the Bears' D scores, we win, always. So looking towards week 7 we need to see the defense tighten up and place pressure on RGIII. The Bears D also need to keep up with their coverage and not let any long passing plays happen in DC. Hopefully Marshall and Jeffrey remain big targets for Cutler and we can head into the bye-week on top of our division. Set your casual style apart with a relaxed fit raglan tee that offers sporty and retro design details along with some chic embroidered western boots that represent your team spirit. 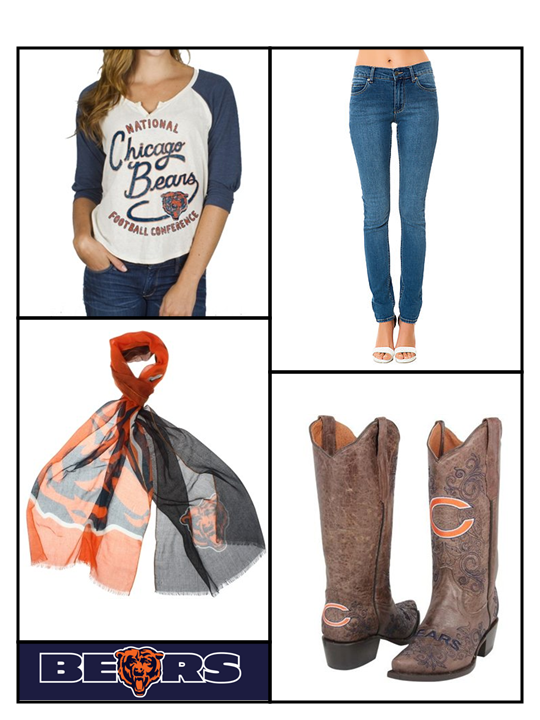 Use the hashtag #BearDownBabes and show me your Bears Fashion for Week 7!